Fitness & FTP Tests | How and Why? Why is everyone talking about protein? I’ve been to a whole bunch of bike shows all over Europe and let me tell you, they can be really quite boring, I mean, I like bike stuff as much as the next person but spending an entire day looking at displays of components inside an airless, fluorescently lit exhibition hall can do my head in. Luckily, Spin LDN is a bit different. An eclectic mix of talks, shows and stands, the show is still relatively new but really coming into its own this year with a whole host of things that are really interesting – print workshops from cycling illustrator Eliza Southwood for example, talks by cool women such as Jenny Gwiazdowski from London Bike Kitchen and an interviews with people such as Martyn Ashton. 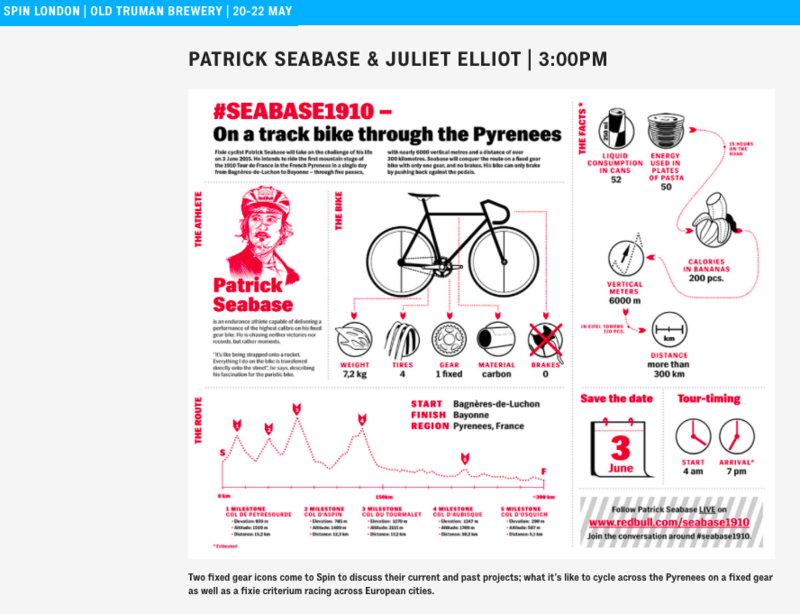 On Sunday 22nd at 3pm, I’ll be on stage with fixed gear rider Patrick Seabase, discussing his adventures riding a track bike through the Alps and Pyrenees and how they compare with my own experiences racing fixed gear crits in Europe. Whilst both of us ride fixed gear bikes, what we do is very different from one another so it should make for an interesting conversation. I’d love to see/meet as many of you as I can there and I’ll be opening the floor to questions from the audience so please come armed with some for myself and Patrick!